Kaido published “Madonna Verde” in 2008 as a sequel to “Gene Waltz,” continuing the story around the controversial issue of surrogate pregnancy in Japan. Kuninaka plays the doctor Rie Sonezaki, known as the “Cool Witch” by her colleagues in the obstetrics department. The character was previously played by Miho Kanno (33) in the movie version of “Gene Waltz.” In “Madonna Verde,” Rie and her husband (played by comedian Jin Katagiri) want to have a child, but Rie lost her uterus due to an earlier illness. She decides to ask her own mother Midori (Matsuzaka) to be the surrogate mother, and the three of them proceed with their plan in secret. However, a man named Maruyama (Kyozo Nagatsuka), who is in love with Midori, finds out about their plan. 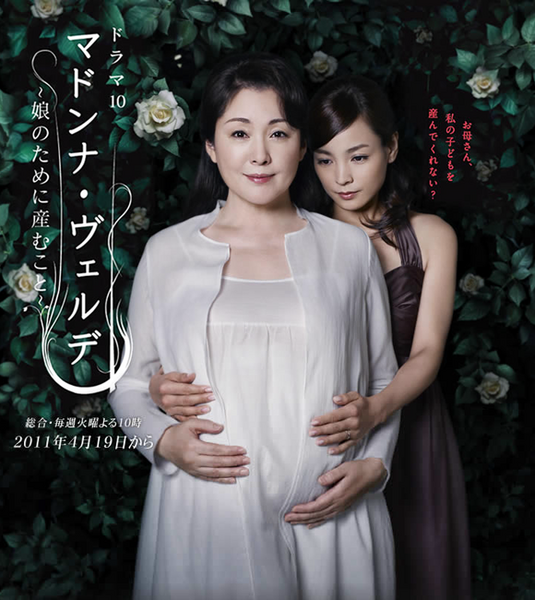 Later, a professor at Rie’s university hospital (Hirotaro Honda) receives an accusatory letter, and Midori and Rie are desperately forced to pretend that the child in Midori’s womb is her own.